The Tiger God Shrine ( San Chao Pho Suea) is a Taoist shrine and was built in 1934. The architectural style is Southern Chinese. According to legend, the shrine is dedicated to the spirit of a tiger who once lived in the jungle surrounding this area and the statue housed here is where his bones and spirit are kept. Apart from the Tiger God the shrine also houses statues of Sein Tein Zang Tee (the god of the north stars), Guan Yu and Matsu (the empress of heaven). The shrine also houses many rare antiques some of which are more than 100 years old. The Tiger God shrine is always busy and usually filled with clouds of incense. During festival times the shrine features music and puppet shows. The shrine attracts mainly Chinese-Thai people and is popular among local Buddhists. 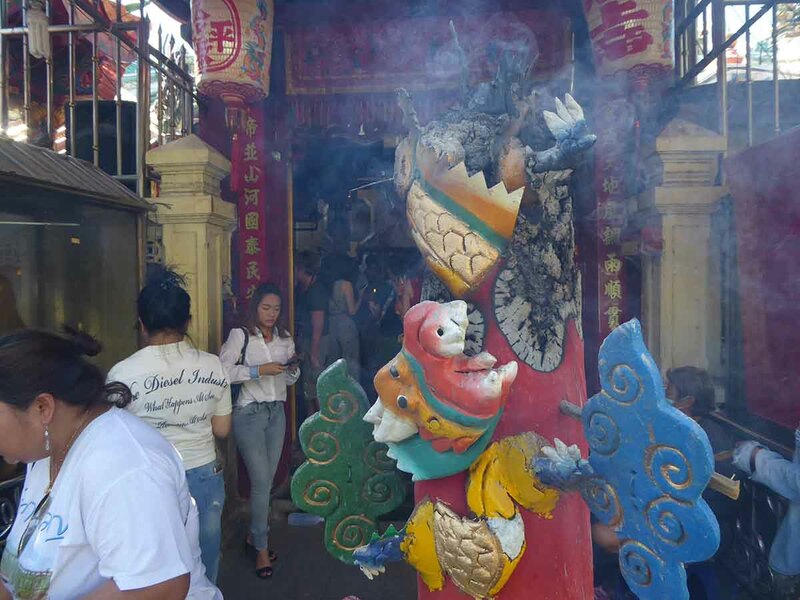 People come to pray for prosperity, good fortune, and protection from evil. 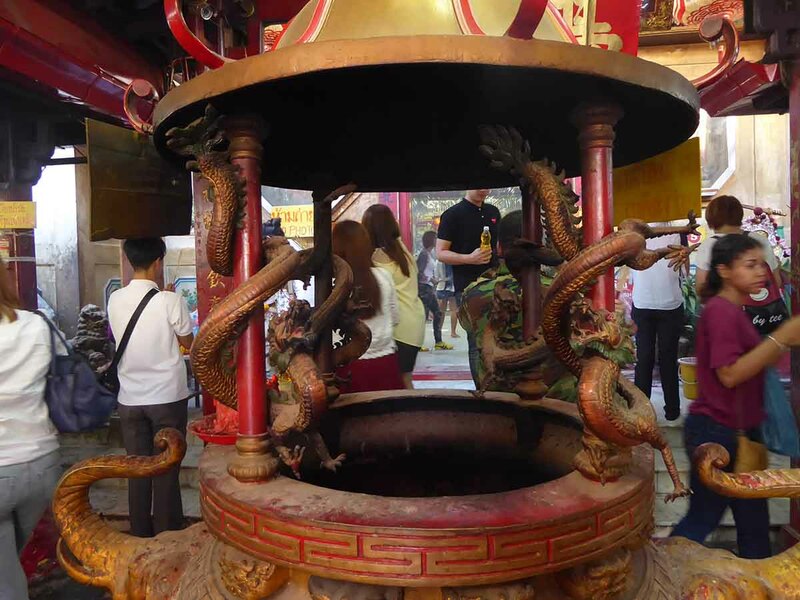 The shrine is popular with couples who pray for a child and bring offerings of sugar tigers. People usually worship the shrine with 18 joss sticks to be burned in six pots, one pair of red candles and one garland and offerings of flowers, cookies, and fruit. To worship the Tiger God, they usually use pork, egg, and sweetened sticky rice. You will also see people casting lots. This is where worshippers shake cans containing numbered wooden sticks until one falls to the floor. The number is then taken to the back of the hall where a corresponding fortune printed on a paper sheet can be found. You can also see wooden blocks being thrown across the floor. How these blocks fall is supposed to help with decision making. 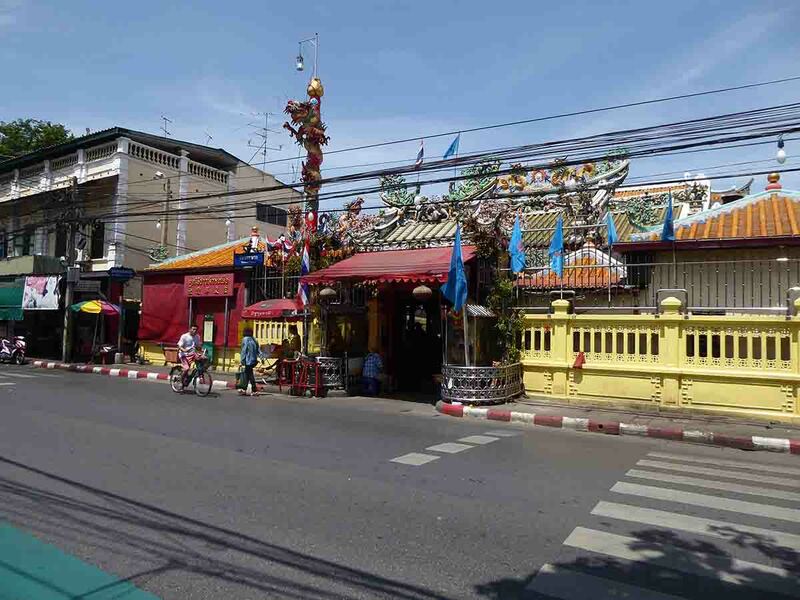 The Tiger God Shrine is an interesting stop if you are visiting Wat Suthat and the Giant Swing which are just around the corner. Rules: No photography in the inner shrine. How to get there: Bus, Taxi, Tuk-Tuk or walk. Bus: No. 10, 12, 19, 35, 42 passes the shrine.